Tanks are tough and strong and so is the Motiv Tank Rampage. This urethane ball was made for the modern bowling game by combining the Alchemy Urethane coverstock with the Gear V2 core. This coverstock is finished with a 3000 Grit LSS finish and offers big overall hook while featuring the trusted smooth urethane shape. Motiv modified the original Gear core to create the Gear V2 which creates a higher RG and tighter track flare. All of these features make this ball one strong yet versatile urethane bowling ball. This ball will defeat lane patterns with wet/dry features as well as higher friction surfaces allowing bowlers to play more angles on more conditions. Urethane is back with a vengeance and MOTIV’s latest one lets you go on a Rampage with it! The Alchemy Urethane coverstock (3000 LSS) creates a lot of traction for a urethane shell yet keeps that same smooth, predictable motion that is expected from this technology. To enhance this reaction, the Gear core (2.48RG, .034Diff) has been modified specifically for this ball and now boasts numbers of 2.55RG, .020Diff. These new specs help push the Alchemy cover further down the lane thereby allowing it to retain more energy for its backend motion through to the pit. I drilled the Rampage the same as my Rebel Tank as I wanted a good comparison. The verdict: they are not even close. The Rampage is far and away more aggressive in the oil, helping to create a more pronounced mid-lane motion which helps to read the transition easier. Control is still the name of the game, but the Tank Rampage adds power to that to create a unique reaction within today’s urethane game. 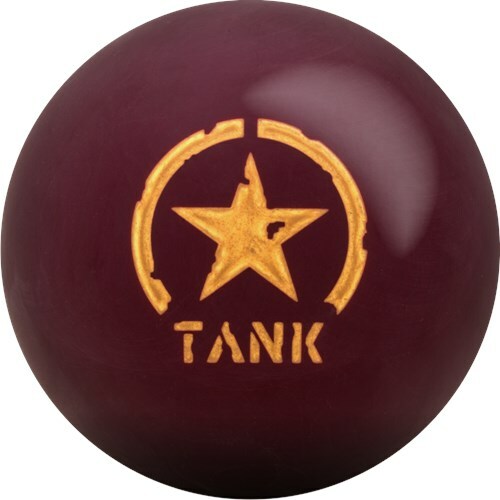 The Tank Rampage is the first urethane ball I have ever owned. The ball is really smooth and strong from what I've seen from other urethane bowling balls. After throwing this ball on a fresh house shot I have a feeling I'll really enjoy it when I need to use it. A great addition to a tournament bag. The Tank Rampage is unlike any urethane I have thrown. I compared mine to my original Tank. The overall reaction with the Rampage is much stronger. I initially thought the Rampage was going to stop as soon as it got to the dry, but it kept hooking and I was quite shocked. The hitting power through the pins is like any reactive ball. Known to the masses as Ron, the Tank Rampage has a well deserved spot in the bag for majority of patterns in the world. The combination overall is an incredible beast especially for those that prefer to play smaller angles on a lot of patterns. This is an absolute must have in any bowlers arsenal. Matching the right surface on the Rampage with the lanes will make for a blast for the one throwing it. With the Tank Rampage, you get a urethane reaction that isn’t so far down on board coverage from the weakest reactive resin balls. It is very smooth and predictable, good or bad. This ball is obviously coming more into play on low volume patterns or patterns that have broken down to a massive over/under that can’t be controlled by reactive resin. It also clearly becomes a must have tool for very high rev rate bowlers who now gain control on top of their innate hitting power. For the rest of us mere mortals, in the medium to high rev rate, the Motiv Tank Rampage will be a good condition specific ball. Get as many as you can! Love urethane? Or, maybe you don't? It doesn't matter! You MUST have at least 3 of these in your arsenal! In fact, I should have more than that. Whether you are a high-level player or an amateur just starting in the sport of bowling, this is the best urethane ball on the market thus far! The Tank Rampage allows me to play even in burned Long Patterns while keeping a nice and consistently strong and smooth hit. It has a great consistency in short to medium patterns. I will have a stronger reaction than you think, trust me! This was the first Motiv Ball I ever drilled, and man it was perfect timing! Page created in 0.67 seconds with 22 queries.